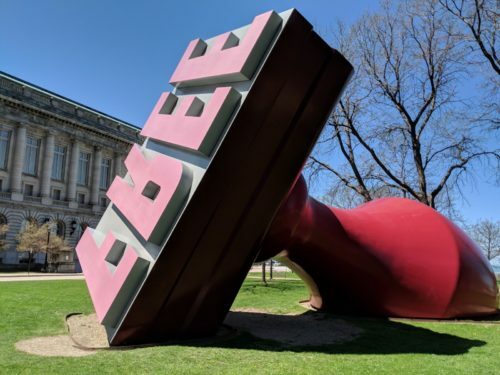 One of Cleveland’s most iconic pieces of public art is the Free Stamp by Claes Oldenburg and Coosje van Bruggenthat. The Free Stamp was originally commissioned to sit in front of the Sohio building being constructed in the mid 1980’s on Public Square. By the time the building was completed, BP had taken over and they did not want it. Eventually the Free Stamp would be given to the city and placed in Willard Park, near the Rock Hall. The original position of the statue was intended to be vertical. It would mirror the shaped of the Soldiers and Sailor’s Monument across from where it would have been placed. But in the park it was placed on its side instead, showing the word “free”. The pedestal it would have rested on outside the old Sohio Building is still there today and used as a planter. We take a look at the statue on our Downtown Highlights walking tour. To book your tour, click here.